Yesterday I came across a great deal on a brand new imagine angler. I wasn't looking for a new boat but couldn't pass up the deal and brought it out today. It's a plastic boat that's very flat and wide like a SUP but has a backrest that lays flat. 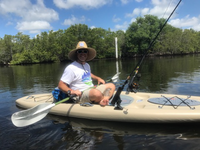 A hybrid kayak and sup. Today was my first time fishing from a paddleboard and I'm definitely a fan. I was even able to use the rod that is too heavy for the kayak. I get that a hybrid won't be great as a kayak or paddleboard but since I plan to use it as both it should work well and still be a better boat than my other kayak. Oh, and my wife caught a jack crevalle! Cool. Post some pics of the board. Sorry I haven't put these anywhere online yet to link them so I added as attachments. 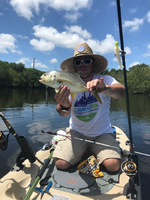 One is me on the new kayak / sup and the other is my wife's jack crevalle! Found this online. Not a bad looking hybrid. It's heavy but very stable and seems to have plenty of deck space. Definitely an easy platform for casting and this was only my second time ever on a sup... the first being 5 minutes that same morning. I'm planning to install a couple d rings to tether my pliers and tools, a cooler with rod holders and a way to secure rods to the deck since I now have enough deck space that I don't have to mount the rods on the side where they're susceptible to damage.